Weeds can be controlled without resorting to weedkillers. Cultural or organic control measures rely on killing or restricting the weeds by physical action, from manual removal to smothering, burning and using weed barriers. All weeds can be controlled without weedkillers, but persistent or deep rooted weeds may be very difficult to eradicate. Ongoing control is likely to be necessary. Annual weeds (which only live for a year) and epehemeral weeds (which live for less than a year) are the easiest to control, as they are usually shallow rooted. However, they can scatter seed prolifically, so usually reappear and require further control. Deep-rooted perennial weeds (which die down in the winter and re-grow each spring) will re-grow from their roots if the tops are removed or burned off. They can be difficult to dig out and may grow up through weed barriers in time. Weeds can be controlled whenever they are troublesome, which is usually in the spring and summer months. It is a good idea to put weed barriers in place in late winter or early spring, as they work better as a preventative than when an existing problem requires suppression. 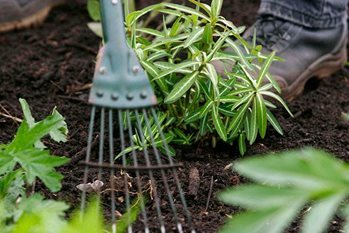 Groundcover or landscaping fabrics can be laid over recently cleared soil to suppress re-growth of old weeds and prevent new weeds from establishing. There are a number of different weed suppressant fabrics available, each with its own advantages and disadvantages. Spun materials: These are usually made from plastic fibres bonded together to form a sheet. They can be used in most situations, both short and long term, but are best covered with a protective mulch of bark or gravel. Woven materials: These are sheets of woven plastic strands for use as temporary cover, or for the long-term on beds, borders and paths. Plastic sheeting: Choose black sheeting to suppress weeds for short periods, or in areas of the garden where appearance doesn’t matter. Repeated control measures are likely to be necessary - this is not a one-off garden task. See our individual weed profiles for more detailed advice on eradication of specific weeds. Some of the most troublesome include; bamboo, bindweed, couch grass, ground elder, horsetail, oxalis and speedwell.